One of the hardest things for me to do, other than admit I'm wrong, is to ask for help. I hate doing this. 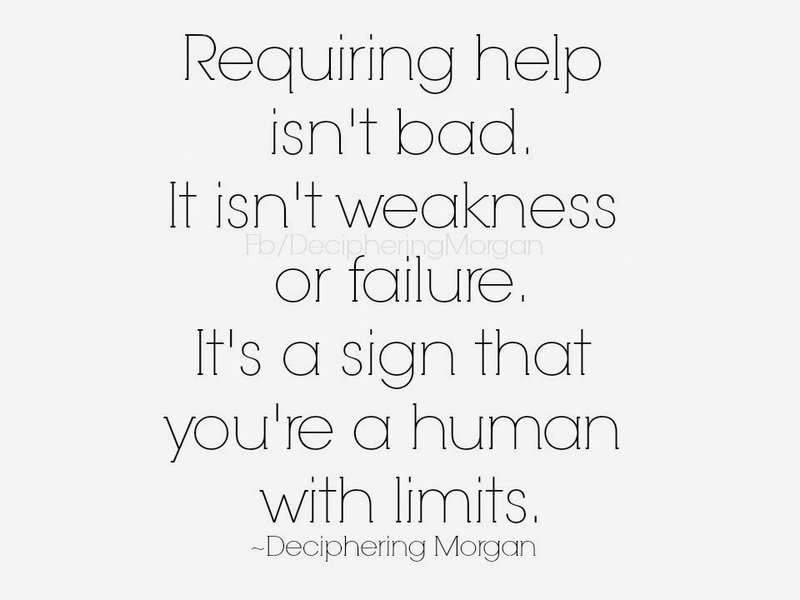 For me, admitting I need help is to acknowledge that I am failing to control, accomplish, or figure something out. I feel like I'm giving up. Admitting I need help is akin to me crying. For me, both are signs that I'm cracking and have weaknesses which can be used against me. Silly, isn't it? There isn't any shame in either of those things. And yet, here I am.. being ashamed that I have been crying daily since last Sunday from both pain and worry. I have no qualms comforting someone else when they cry. I am usually the first to jump in and help those in need. However, when it comes to me, I feel as though I am failing myself and, consequently, failing everyone else around me because I cannot do it on my own. This is such a ridiculous thought process. After asking some of my friends (all special needs moms), I found that I'm not the only one to feel this way, which made me feel less crazy. 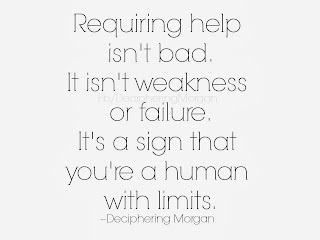 Among the responses, I was told that they don't ask for help for fear of looking weak, incapable, being gossiped about, and the thought that no one can really do it like they can. And you know what? I can relate to every single response. There's the reliability factor. Oftentimes, someone will say they will help and then not follow through. As a special needs parent (or, I suppose, any parent), this is a major issue. What if you're needing help watching special needs child #1 while you take special needs child #2 to the doctor and your respite worker or sitter cancels? Then you're screwed. If this happens even more than one time, you develop trust issues. Avoiding pity is a big factor when not asking for assistance. We don't want your pity. We know when we're being pitied. It isn't pleasant, to say the least. And we know when there is condescension. We know when people see watching our children as a chore, and that hurts like hell. For several of us, it has been drilled into our heads that the only people we can rely on are ourselves. Being taught independence is wonderful, but at what cost? When you're breaking down and needing to reach out for help, how do you go about that? Trust seems to be the biggest key with all of us. How do we trust someone to help us? Trust that this person will do a job well enough that it's even worth us swallowing our pride and reaching out and asking for help? I know that, in the past, I've asked people for help and they've basically watched television while I did my everyday chores, chased kids down, and wound up more exhausted than I was when I started. I was asking for help, not to babysit someone else. Also, who can we trust with our children? I know I can count on one hand the number of people I can trust to watch my boys. We shouldn't be afraid to ask for help. We shouldn't fear recriminations for doing so. We shouldn't feel ashamed for needing help. We should follow the policy of "love thy neighbor" enough to want to help when we see someone in need. We should, as human beings, not be afraid to ask for help. When we're at our breaking points, there should be no shame in asking. And yet, every time I've asked for help or received it in the past week, I've both thanked people profusely and then apologized to them. I feel shame in being "needy." I've been messaged by people all over the world since Friday's post, asking how they could help my boys, my husband, and me. I've been told that I'm brave for speaking up and asking for help, but I'm not. I'm asking for something for my children, not myself. I can't stand asking for favors for me. All I might have done is be honest about feeling so steeped in my own pain that I can't do for my children what I normally do. I took a chance. That's all. Asking for help shouldn't be this hard, but it is. I always feel like I'm failing myself and my family when I ask for it. It just shouldn't be this way. If you see someone in need, someone struggling, or someone with their hands full, ask if you can lend a hand. Should they say "no," please assure them (and please mean this), that you are there for them should they need help. Just the offer means more than you know, especially if they are a mom like me. hugs Jessi! If I were closer, I would def be lending a hand!